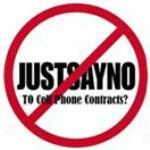 The most detested words in the cell phone industry are “cell phone contract”. The word contract conjures up feelings of confinement, frustration and anger to name a few. So what do your choices look like if you don’t want to sign your business up on a new contract, should that contract be detested or does it make good financial sense to sign one? First of all, we need to realize that today’s cell phones or smart phones are more powerful than computers of a few decades ago. As a result, they aren’t cheap. I once heard my barber refer to buying a big screen TV or a smart phone and somehow the example just put things in perspective. Spending $600 or more to purchase a smart phone out right is a lot of money and if you are purchasing a fleet of devices for your company, certainly a sizable financial investment. Let’s look at a real example we saw recently where ACME Inc. (company name changed of course) wanted to stick it to the man by not signing a contract. ACME Inc decides they don’t want to sign a contract and choose to purchase 5 smart phones for their team at full price. So they go out and spend $2,500 on devices. Scenario 2 – Bite the bullet and sign the contract? ACME Inc. realizes – damn! that’s a lot of money to spend upfront – what other options do I have? Well, the same 5 smart phones on a 36 month contract costs ACME Inc. $250 in total, but as an incentive to bring their business to a new cell phone provider they receive $1,000 in conversion credits ($200 per device). Conversion credits are FREE money the carrier offers you to win your business and it is applied to your bill in the form of a credit. So effectively, ACME Inc. puts $750 in their pocket or more precisely on their bill. ACME Inc. also takes advantage of a special promotional deal at that time, and gets the following – 2,450 mins, Unlimited Incoming, EW @ 6PM, 6GB of data, VM10 all for $350 per month. Instead of spending $2,500 of your precious cash on 5 cell phones outright along with $75 more per month for 3 years, just for the benefit of not signing a contract, save your money. Okay, that sounds a bit like the commercials, but seriously, it just doesn’t make sense – to me at least. I chose this example with 5 phones because it’s more common but we (team at myCELLmyTERMS) have worked with business owners with 10+ units that come in with a similar disposition. 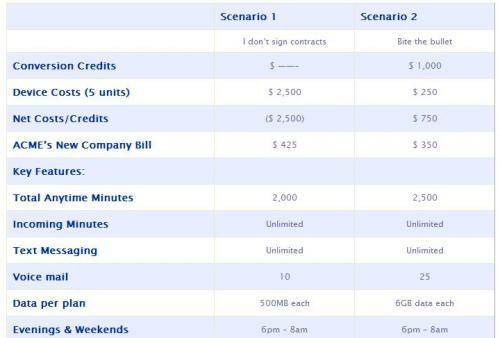 As you can see from this example the more devices your company requires the easier the decision to sign that new cell phone contract becomes, especially given the initial outlay of cash required to do otherwise. Further to this, purchasing devices outright to avoid the contract means that the cell phone plans offered by the Big 3 (Rogers, Bell and TELUS) aren’t as good. In other words, the promotions advertised aren’t available to you if you say no to the contract and opt for the plan only and in the long run you end up paying more per month for less value. So while we don’t advocate the current structure of the cell phone plans for a contract versus no contract, we have to make the most of the circumstances and play the game to win. So, do the math or let us do the math for you and help you save on your cell phone bills. It’s not rocket science, however, a little math can and does go a long way. Which option would you choose and what can you do in your business with $3,400 this year? Our Success Stories demonstrate how we help Canadian businesses save thousands of dollars on their corporate cell phone bills. Are you or any of your friends or colleagues looking for help with their cell phone bills?